It’s already 2019, and everyone is busy with plans for the new year. Some people already look for new destinations for vacation, others try to find a new job in a foreign country, and some digital nomads want a new place to work and travel to. 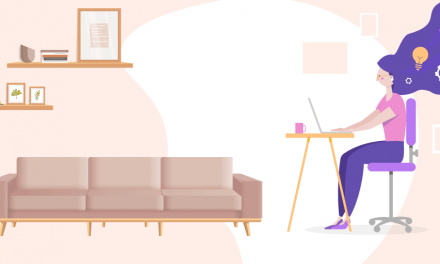 Places like Bali, London, Lisbon, Chiang Mai, and Barcelona have already established nomadic communities and are prominent among digital nomads. However, if you’re tired of the hyped destinations everyone visits — you are in the right place. We’ve spent a lot of time looking for new, fresh and somehow unique locations where you can do digital nomading this new year without spending too much. If you like walking, drinking coffee and contemplating arts, Zagreb — the capital of Croatia can be your next destination. This city is famous for its beautiful streets, antique churches, and neo-baroque buildings. If you go out of the city center, you can find the creations of young street artists and many small cafes, where you can drink coffee or beer and have a nice time with your friends. A good thing about Zagreb is that the most part of the younger generation speaks English and people are very open, which makes it a great place to settle for some time. Zagreb offers hotels, hostels and Airbnb rooms for all price ranges. You can find an Airbnb apartment in the suburbs for as little as $300 for a month. Another option is to book a hostel for $20 a day. If you prefer the bustle of the center, a decent apartment will cost less than $600. You can have cheaper offers if you book in advance. If you don’t like walking, Zagreb offers a wide variety of public transport. A monthly ticket for a trolley is $53 and getting a taxi costs $0.6 per km. In general the price level for food is similar to the prices in Europe. If you stick to local brands, you can save quite much. Eating out and drinking is also very affordable if you do so in small local restaurants and drink local vodka and beer. WiFi is widely available in Zagreb. You can find free WiFi in almost all cafes and bars. Be aware that in crowded spaces the speed can be slow. Zagreb has a great deal of co-working spaces where you can have your work done and make connections with other digital nomads. You will enjoy working in HUB385, Impact Hub and others. The climate in Zagreb is continental, but you can always move to the coastal areas if you like more of the Mediterranean climate. Zagreb is a relatively safe city, as the crime rate is quite low. Yerevan will conquer your heart as soon as you land in Zvartnots airport. The architecture of the city moves towards European but still keeps its national identity. You can walk in the city center and contemplate the authentic pink buildings and houses, drink Armenian wine and brandy in small cafes and restaurants. If you are interested in the history, you can go to a number of interesting museums and head to the bars and clubs next – to listen to wonderful Armenian melodies or to dance in the crowded clubs. Armenia is a small country surrounded by mountains and stunning nature, so whenever you feel adventurous go hiking, visit the historical monuments, ancient churches, and beautiful forests. The majority of the population in Armenia knows English, and almost everyone speaks Russian. 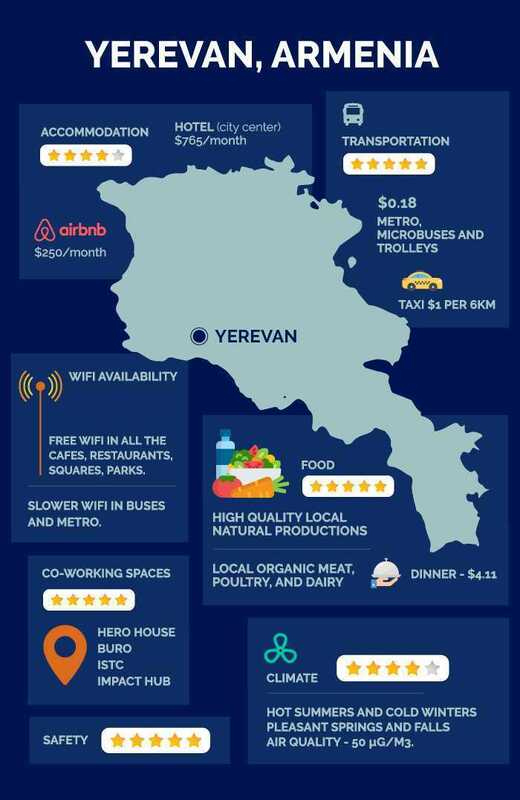 Taking into consideration that living is affordable there, Yerevan becomes a great spot to spend some time working and traveling. The hotels, hostels and private apartments are available at different price ranges. Compared with Europe, the prices are lower and more affordable. For about $250 you can get a small cozy apartment at Airbnb near the city center. The privilege of Yerevan is that it’s not too big and you can easily reach the city center on foot from almost anywhere. If you need a quicker way, various kinds of public transport are available to quickly take you from one part of the city to another. Metro, microbuses, and trolleys cost $0.18 without any time limit. Taxi is also very affordable and costs slightly more than $1 per 6 km. You can always order a taxi online, which is quicker and more efficient option than waiting for the public transport to come. The food in Armenia is a lot cheaper than in Europe. The quality is considerably higher due to various local natural productions as fruits and vegetables are grown in the area, meat, poultry, and dairy are all local too. Eating out is not very costly either. You can find cafes and restaurants of all cuisines and price ranges. If you like drinking, you will also be happy to find a decent Armenian wine for just $3 a bottle. Home-made wine is even cheaper! Internet in Armenia has a good speed which makes working remotely a simple deal. You can get free WiFi in all the cafes and restaurants, as well as in almost all the squares and parks. A small bonus: there are WiFi hotspots even on buses! There are many co-working spaces located in different parts of Yerevan. The most popular ones are Hero House, Buro, ISTC, Impact Hub, and others. If you enjoy all seasons of the year, Yerevan is an excellent choice for you. It’s cozy and warm during springs, hot during summer, mild but rainy in fall, and cold and snowy in winters. The probability of any accident happening to you is quite low because Yerevan is a very safe city. South America has always been a popular destination for digital nomads due to its beauty, charm and cheap prices! Although not everyone considers Sucre, the constitutional capital of Bolivia, as their new destination. But the thing is, you definitely should. Sucre is a cozy city with white buildings and beautiful surroundings. There is always something happening in the city: parties, festivals, and celebrations. So you won’t be bored and will always have something to do. Sucre also has a variety of museums, cultural destinations, and sightseeings for every taste. Besides that, you can learn Spanish with a native speaker for a moderately affordable price – only $4 per group session! You can easily find a good apartment for $300 a month with great views from the balcony. Hotels, hostels, and private rooms are also an affordable option. Transportation in Sucre is quite accessible. The main sightseeings are easy to reach on foot, but taking a taxi will cost around $1. Public transport is also inexpensive with many routes which will can take you not only to each part of the city but also to surrounding villages and sightseeings. Like everything else, food in Sucre is also affordable. There are lots of bars and cafes where you can eat a fulllunch for $3. The city has a variety international cuisine restaurants as well good places for vegetarians, so all your food cravings will be satisfied. Until recently the internet was poor in Sucre, but the situation has changed with the launch of the first communication satellite. Now you can easily get free WiFi in hostels and cafes. 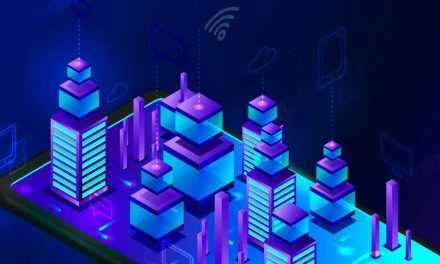 Besides, you can purchase personal WiFi hotspot,called MiFi, and use it for your own: the speed will be good enough to do a variety of things, including Skype calls. 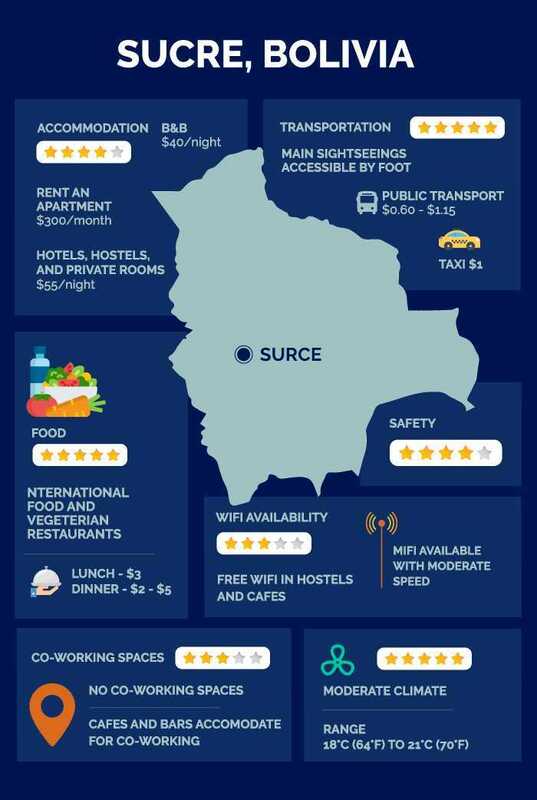 Sucre became transport-available just recently, so there is no high tourist flow and no co-working spaces. But if you want to work outside of your house, go to cafes and bars where you can spend your time working and enjoying a good drink. If the cafe is noisy and you have to start a conference call, you can use Krisp app to mute all the noises around you and other call participants will only hear your voice. By the way, you can also mute the noise coming from call participants to you. The climate in Sucre is incredible. The sun is shining most of the year so you can get a beautiful tan and a decent amount of vitamin C. The temperature is high but you can treat yourself with cold drinks, and you will definitely feel better. The crime rate in Bolivia is quite low. The corruption level is high in the country, but that doesn’t affect tourists and nomads. It’s totally safe to walk in the city during the day and night. As elsewhere, just be careful! If you’ve been traveling and working in Europe for pretty much time, if your heart needs adventures and if you are brave enough, pack your stuff and head to Marrakesh — the most diverse country in this list. Influenced by Islamic, Spanish, Berber, and French cultures Morocco is a unique country with unbelievably beautiful landscapes, kind people and lots of fresh and tasty food. Today Morocco is a developing entrepreneurial location with lots of startups being funded in the area. Marrakesh, one of the most beautiful cities of Morocco, is an excellent destination to start from. 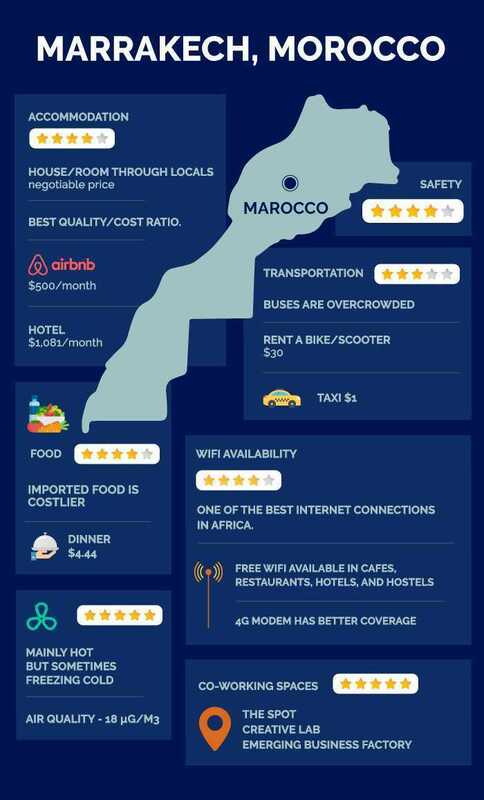 Prices in Marrakesh have one of the best quality/cost ratio. To find the best option, you need to look for houses in Airbnb. You can book an apartment near the city center for less than $500 a month. Hostels and hotels offer Finding a house or room through locals is also a good idea — you will be able to negotiate the price! If you frequently stay in the city, go ahead and rent a bike or a scooter because the streets of Marrakesh are pretty narrow. Also, always ask taxi drivers to turn on taximeters, which they might intentionally forget to turn. The average taxi ride near the city center will cost you $5. There are also buses available in the city, but they are too old and overcrowded. Food is not expensive unless it’s imported. You can buy a bunch of fresh fruits and vegetables in local small shops. Drinking in public is prohibited, but and you can get alcohol in some of the big supermarkets, clubs, and bars but drinking in public is prohibited. Morocco has one of the best internet connections in Africa. It’s not as fast as in Europe but good enough to work remotely. There is free WiFi available in most of the cafes, restaurants, hotels, and hostels. As Marrakesh is entering the world of entrepreneurship, there’s a good number of co-working spaces where you can get done your work and meet with other digital nomads. Hubs like The Spot, Creative Lab and Emerging Business Factory are among the nomad favorites. The climate in Marrakesh is exceptionally fickle. It’s mainly hot but sometimes it can get quite cold, so take a coat and a sweater with you, just in case! Pickpocketing and scams can happen in Marrakesh, but happily — not more than that. The city and the country itself are considered safe. If you need to change your location but don’t want to travel far, Belgrade,otherwise known as “White city”, can be a great destination for you. It has beautiful architecture, inexpensive accommodation, and tasty food. You can experience Slavic hospitality as Serbians are friendly and open to tourists. Besides that, Belgrade has an active nightlife, so if you’re a party person, consider it for your future nomading. You can find an apartment for under $600 and a private room for $400 in the city center on Airbnb. If you need cheaper options, hotels and hostels can be your go-to choice, if you book them in advance. The monthly pass for public transport in Belgrade is relatively cheap — around $30. You can also get a taxi which starts at $1.4 and charges $0.5 per each km. Note that taxis may charge more in the evenings. As in any European city, there is a decent internet coverage in Belgrade, and you won’t have any problem finding WiFi spot.. Eating out and food, in general, is not expensive at all. A proper meal can be $6 and even cheaper if you cook at home. There are lots of cafes and restaurants, but you better try national dishes and Slavic ones — they are amazing! 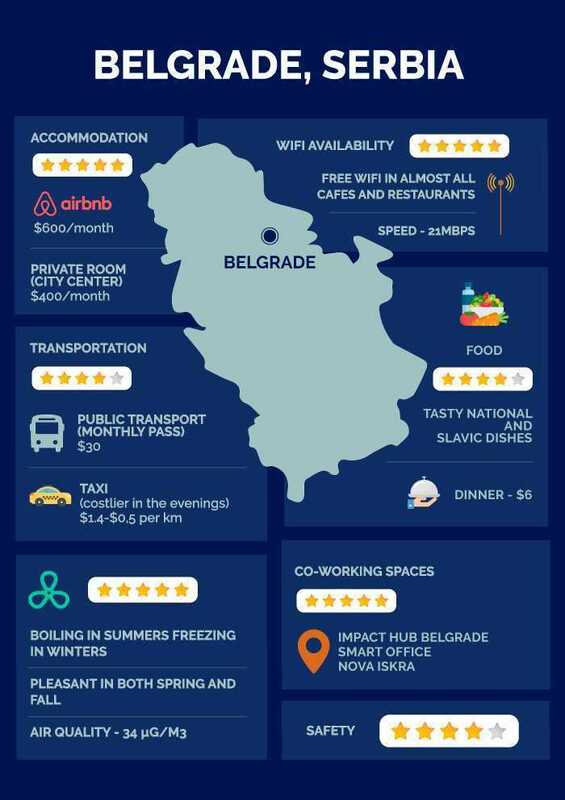 There are many co-working hubs in Belgrade, and the monthly price is near $150. Some of the most popular ones are Impact Hub Belgrade, Smart Office, Nova Iskra, and others. Belgrade is a city where you can enjoy all of the seasons. It’s boiling hot during summers, freezing in winters and amazing in both spring and fall! Violence rate in Belgrade is pretty low. The city is open to guests, and the worst thing that can happen is pickpocketing. Choosing the next destination for traveling is sometimes challenging because of many countries and beautiful cities worth visiting. We hope that this article helped you with your decision and that soon you will head to one of these amazing cities! PreviousKrisp Won a Golden Kitty Award on Product Hunt!